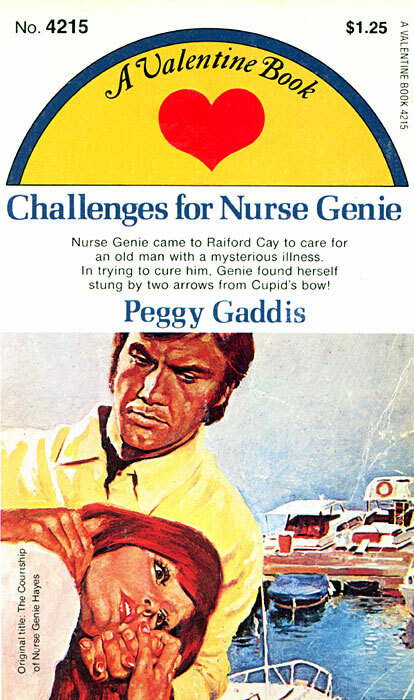 Nurse Genie came to Raiford Cay to care for an old man with a mysterious illness. In trying to cure him, Genie found herself stung by two arrows from Cupid’s bow! Nurse Genie Hayes found two challenges awaiting her on her arrival at the small Bahama out-island of Raiford Cay — the challenge of caring for old paralyzed Henry Raiford whose illness was a mystery to everyone, including his family…and the challenge flung at her by the beautiful Janice Burton to keep away from Captain Aleck Rogers and Scott Raiford, the two handsome eligible men on the island. Genie’s medical training helped her meet the first challenge. But she wasn’t prepared for the breathless effect that Aleck’s and Scott’s kisses would have on her. How long could she continue to blame the tropical moonlight and the romantic scent of jasmine for the wild pounding in her heart? Even after she’d stopped struggling, Scott Raiford kept a firm grip on Genie Hayes’ soft, delicate throat. Her eyes, still wide with astonishment, stared blankly at the yacht that was to have carried them away…away from the cares and troubles of this small, remote island. But there were only two things that would be carried away that afternoon: Nurse Hayes’ lifeless body, carried out to sea by the ebbing tide…and Nurse Hayes’ heart, so full of hope and promise, carried by angels to a place where she and Captain Aleck could finally be free of Raiford Cay. Where there would be no more…Challenges for Nurse Genie.